Just looking for a cool gaming setup or wanting some inspiration to make the best gaming setup you can dream of? If so, you’re in the right place. PC gaming has become one of the most lucrative and popular forms of entertainment in recent years. With that increased market share, more and more people have become interested in building their own PC. That means there’s a community and people who are willing to share their builds with the rest of the world. So, today we’re going to showcase 10 of our favorite gaming PC setups being posted around the web as of early 2019. We’ll also give you a sneak peek at what’s under the hood so you can understand why it’s really on our list. With these, you should be well on your way to making your dream setup reality. 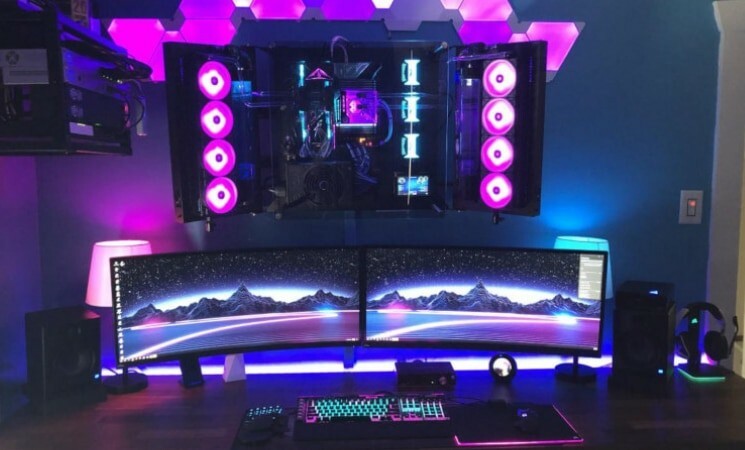 If you’re inexperienced with PC building, you might want to make sure you want to familiarize yourself with how to build a gaming PC before looking over the best gaming setups of 2019. $500 Prebuilt - This roundup can handle AAA games with only a few sacrifices in the graphics department. $800 Prebuilt - Our mid-range prebuilt gaming PC roundup. You can play AAA games at 1080p around 60FPS with little to no compromise. $1000 Prebuilt - You can play all your favorite games at 1440p resolution with high graphics. $300 Build - Our budget build perfect for eSports and modern games run at lower resolution. This cheap gaming setup is also highly recommended for entry-level builders. $400 Build - Another budget gaming desktop computer setup capable of running modern games at 900p and 1080p resolution. A true console killer build. $500 Build - This gaming computer can handle games at 1080p resolution at high settings with ease. $600 Build - An ideal budget build perfect for running games at 1440p resolution. Running VR at low settings is also possible. $700 Build - This build can run games smoothly at 1440p now. Content creation also becomes very possible with this build. $800 Build - Running games at 1440p on high settings is starting to become feasible with this build. $1000 Build - You can start running games at 4K resolution and content creation starts to feel very feasible. $1500 Build - This is where serious high-end 4K gaming and high-end content creation starts to feel good. $2,000 Build - This is the end-game build for both 4K and content creation. If money is no object, this is it. Oh, and before we start, these are in no particular order. This setup has a total of 5 screens. The 4 IPS monitors stacked together and a 4K television to your side for purposes other than productivity. This setup isn’t exclusively for gaming, obviously, as it’s specifically made to inspire serious content creators. In fact, this can easily handle 7-8 virtual machines-- each doing dev, image, and video work at once. Aside from the plain black case, we don’t really like that the resolution of the top two monitors (1080p) differs from those on the bottom (4K). While this can come in handy on certain projects, it can also come off as being tacky. Still, this is technically a very minor nitpick of a practical matter, so it’s far from being a deal breaker. The build is already good enough for what it is… but if you’re going to build your own “submarine cockpit” theme, add some barometers in… and RGB. We all love a clean and flexible setup. This is what Reddit user u/cfbModsAreAssMyDude’s first build looks like. The wireless keyboard and mouse keeps up the clean aesthetic and ensures there aren’t any unneeded wires hanging around; it looks really clean because of this. Plus, the wall mount lets you change the monitor from portrait to landscape easily-- perfect for streamers and other productivity use. The wires to the monitors from the system unit ran out the back side of the cabinet, up the walls, across the attic a few feet and back down the wall. This means that moving things around will likely be a huge pain. 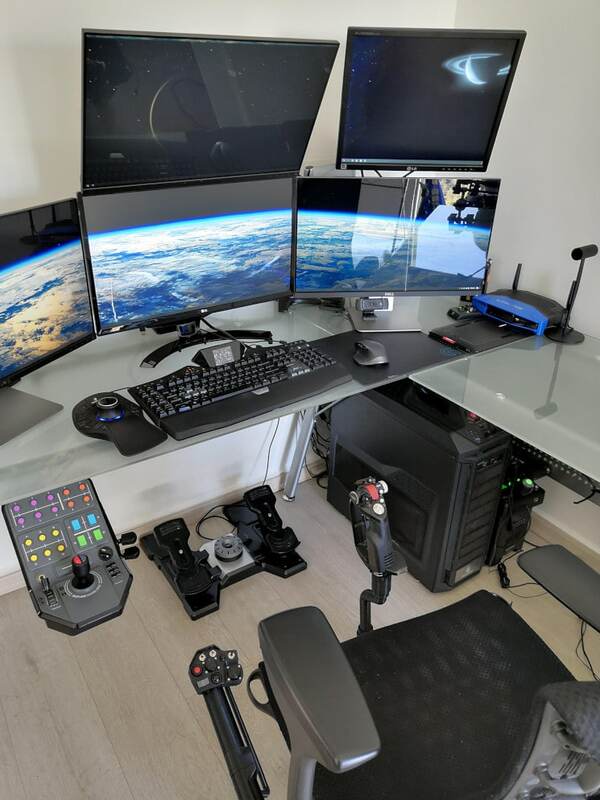 A racing gaming chair with lumbar and neck support is highly recommended if you’re going with this setup… and a potted succulent plant for aesthetics. 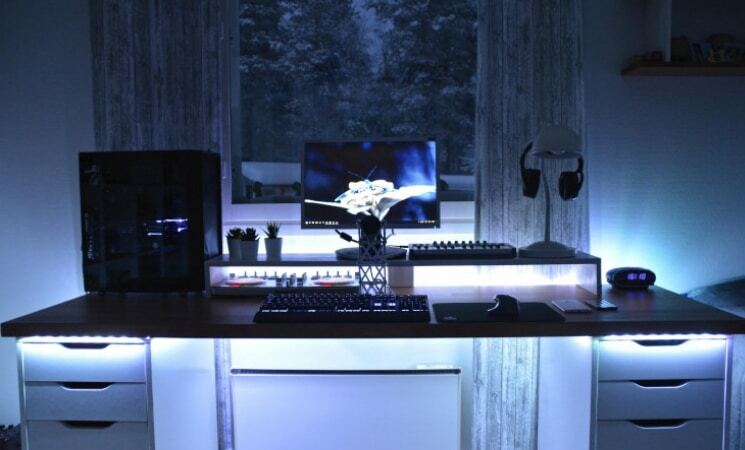 Niklasiivari’s setup already looks cool with the the LED lights under the desk. But what really nails the chilling theme is the snowy environment outside the window and the desktop background. This is peak aesthetics right here. The entire build looks clean enough-- it’s one particular thing we really like about the build. It’s just that this featured an old LG monitor. A widescreen or a dual monitor upgrade will definitely make this look far cooler than it already is. 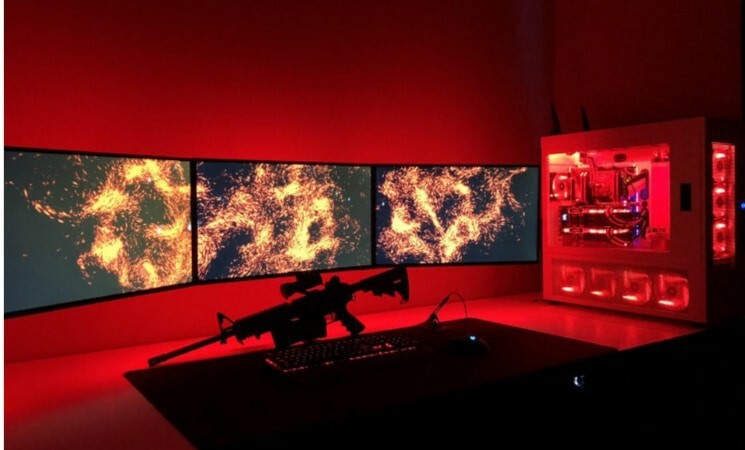 If you’re going to build something as cool as this, go with a dual monitor if you’re into streaming and an ultrawide monitor if you do content creation like niklasiivari. There’s also room for other small upgrades, like some HDD storage (500 GB isn’t a lot) or even a better GPU. 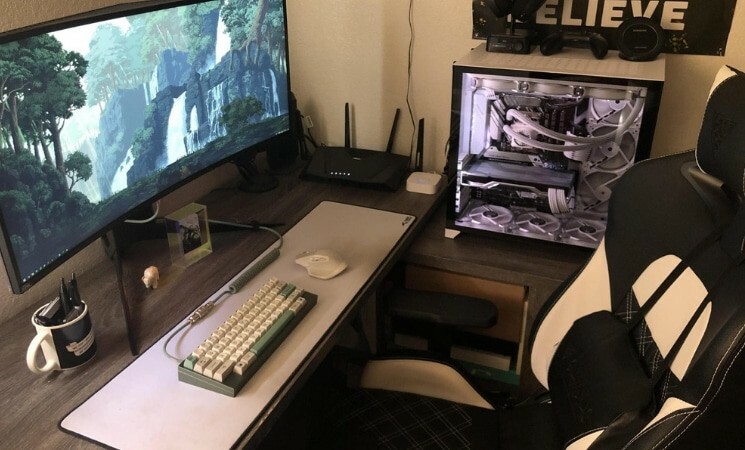 _anthong’s setup is simple and clean thanks to its: ultrawide Alienware display, a HHKB Tofu Case in Dark Green from KBDFans, and SA 9009 keycaps keyboard and Logitech MX Master 2S mouse combo. It isn’t as aesthetically fancy as some of the other builds on this list, but it does deliver without compromise, nonetheless. Playing on an ultrawide monitor will put you ahead in most games. But live streaming on a 21:9 resolution monitor isn’t ideal as this will show black bars on the top and bottom part of the display when viewed from a 16:9 resolution monitor, which usually drives viewers away. If you want to stream, we recommend you get a separate monitor. Or you could set the game to 1080p windows mode or borderless window and have your preferred streaming software capture that instead, which will surely come off as strange as it sounds. 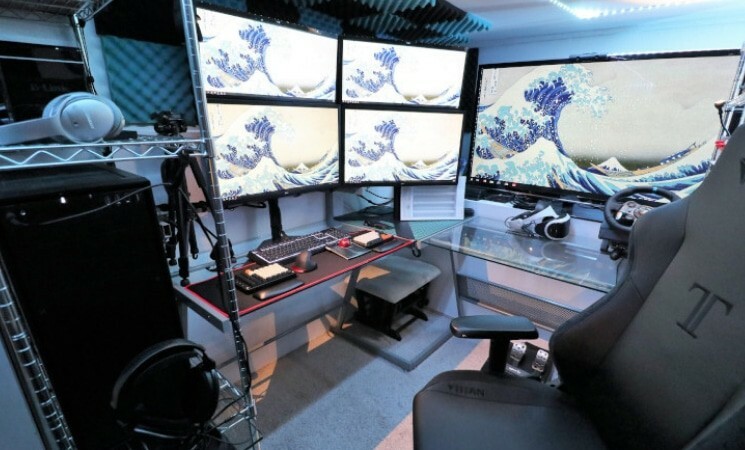 This is a setup that should inspire gamers who have nothing but a small PC desk. You have a smaller monitor for all your games and a larger one just above it for other purposes like watching TV. The gaming desk setup may look crowded but you still have more than enough space to move your hands around. The speakers. A pair of larger, wall mounted speakers flanking either side of the TV/monitor should give you more room. Room you could use to improve aesthetics, like with a potted plant, or to just give you some room. If you’re going to follow this and make a similar setup, make sure you have enough natural light as well as room for your speakers, because chances are you have better (and bigger) speakers than this. Alternatively, a headset should sort this out if you’re willing to use it, too, when watching movies on the big screen. If you’re not digging the lamp being on the desk, and thus in your way, you might want to browse some standing lamps. However, you do want to be careful as this could add more of a glare on the TV if they’re used at the same time as one another. 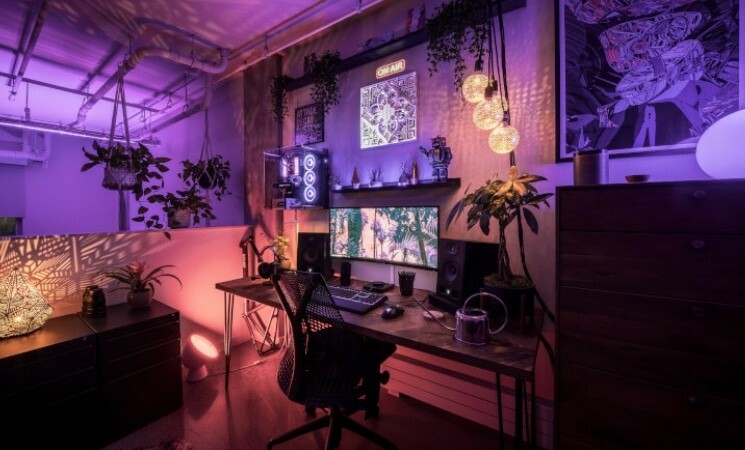 If you’re into retro, neon aesthetics, use this setup as inspiration. Everything from the ground up is filled with retro-themed lights. 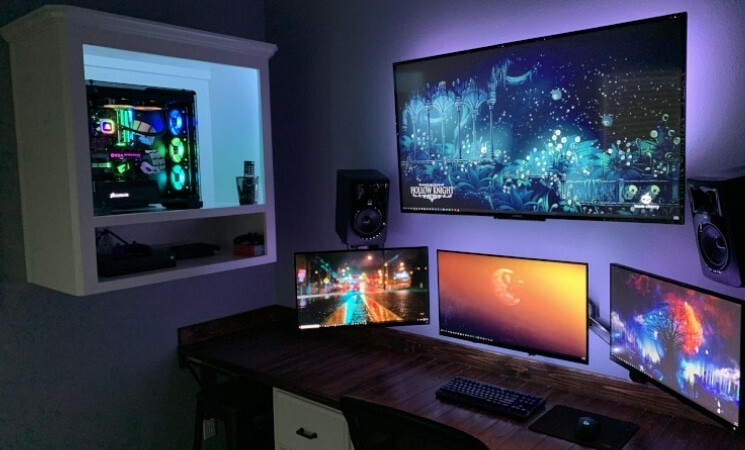 From the two ultrawide monitors, the lamps, the mouse and keyboard, and most especially, the case, showcasing a rainbow of retro lights. The only thing that we didn’t like about the setup are the 2 ultrawide monitors. Gaming with only 2 monitors is just inconvenient because of the bezels. Moreover, there are some issues with having only ultrawide monitors (which we have discussed in some of the above builds that feature ultrawide monitors). One Ultrawide is great, but we wouldn’t be opposed to swapping it out for 2 smaller 16:9 monitors. Of course, this might increase the overall build cost unless you’re going for 1080p monitors. There’s only one thing we would like to recommend to users who would use this as inspiration: get 3 monitors instead of 2 so you can make use of all the display at your disposal. This setup is perfect for simulation games. The 5-monitor setup lets you see all the things you need to with ease. Specifically, games like Euro Truck Simulator and farming simulation games are perfect with this kind of setup. You also have a smaller monitor you can conveniently place either to your right or left for other purposes. It’s as if there’s nothing wrong with the build but racing games will definitely benefit from a racing wheel accessory. Specifically, this build is perfect for what it is but finding a way to add a wheel installed at your disposal will definitely put the icing on the cake. 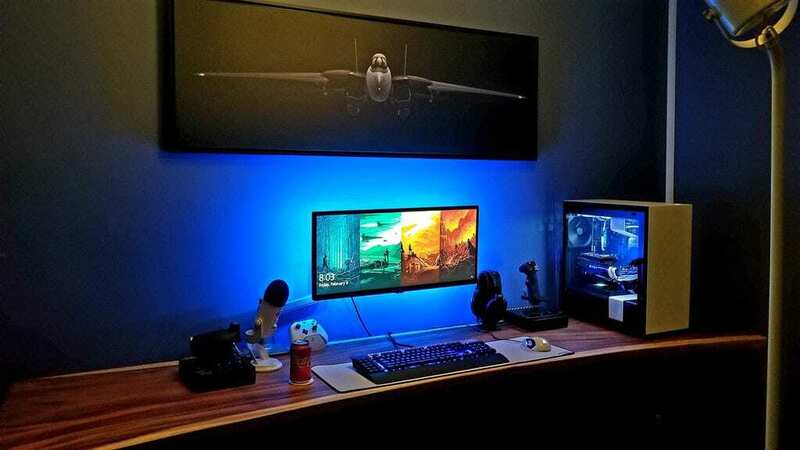 How clean it looks is what makes it worth mentioning as one of the coolest gaming setups or more specifically, one of the best gaming setups in early 2019. The monitor near the system unit does a pretty good job at concealing the wires to the monitor (although the angle the picture was taken at certainly helps) and this is something you can surely use if you’re planning to come up with your own cool gaming setup. We’d really like to see more natural light in this setup; although, it’s likely that there’s a window to the right. Proper lighting is surely something we’d like to have with this build as it does look like this is located at a corner that’s away from natural light. If you’re going to follow this setup, place it near a window for some natural light and that’d be perfect. And some track lights, too. The entire setup gives you a naturey feel with the plants all around you-- even hanging from the ceiling. The ultrawide monitor, as well as the lighting, just makes everything look and feel natural. Not to mention how the watering compliments the entire setup. While this isn’t the first build to do it, it’s worth noting how you can use extra lighting outside of the traditional RGBs to make the build-- and room-- come to life. Here we see “spotlight” pointing up, as well as various lamps. Overall, if you’re into gardening and plants, you might want to use this as inspiration. While it’s true that you get a cool feel sitting and playing games here, the addition of natural light will surely complete the puzzle. If you’re willing to go up the extra mile to use real plants as an ornament, make sure they’re plants you can grow indoors (further reinforcing the importance of natural lighting). Or just use plastic plants if you want. 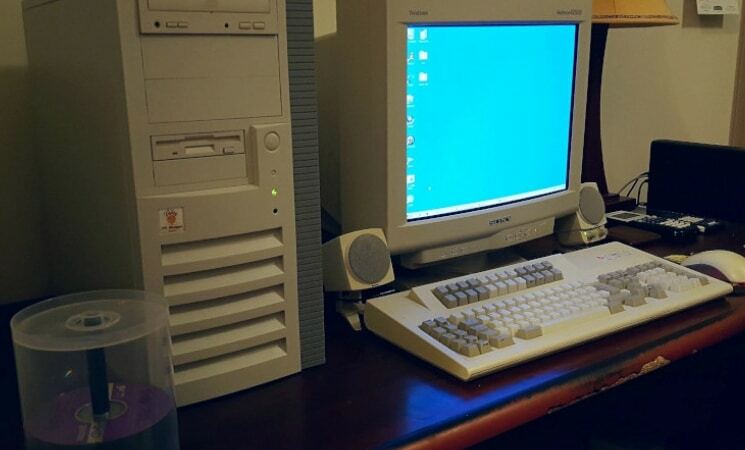 This may look like a 1990’s computer setup but don’t let the looks fool you. Because even with the old CD spindle case beside it, inside is actually a modern processor-- a Ryzen one at that! As well as a powerful GTX 1060 graphics card that can handle AAA games at 1080p resolution. How old looks meet the modern performance is what earned its place as one of the best gaming setups in 2019. To build an old-themed computer is nice, but you’ll have to remember that you’ll have to sacrifice resolution as well. And this is the case with this setup. But surprisingly enough, this has a native resolution of 1600 x 1200 @ 75Hz. That’s 15 Hz more than most modern 1080p gaming monitors that usually has 60Hz. Also, you’re still left with a 4:3 ratio monitor. Adding more RAM and getting a more powerful graphics card is going to make this a beast in sheep’s clothing. At this point, chances are you know what you need to build a gaming PC. But if by any chance, this is your first time or you’re still a young padawan in the world of PC building, the following tips will surely come in handy. It’s likely that you’ve heard about these before. Antistatic wrist straps do a really good job at dissipating excess electricity that could damage small components-- think static electricity-- from your body. When building a gaming PC for the first time, one of the most daunting tasks is hooking up the right cables to the motherboard; motherboard manual enters screen left. If you lost the manual for whatever reason, then you should be able to easily find it online. Or even better, head over to the manufacturer’s website. It’s important that you future-proof everything when building your ultimate gaming setup. That’s to say, you should plan ahead for what components you will need to upgrade and how long each component will stay powerful enough to be relevant for your intended uses. In particular, you might want to splurge on core components, such as the power supply and hard drive, that can be reused in different systems as you upgrade. CPU and CPU Cooler - The processor, or the heart of a computer. This processes all the tasks your computer performs and, ideally, you want to get a modern one to make a worthy investment that will last you for years. Motherboard - This is where all of the hardware components and parts are connected. Depending on the chipset and the type of motherboard will be how far you can push your system’s capability. Ideally, you’d want to invest in a CPU first and then you can choose a motherboard that’s compatible. GPU or Graphics Card - Graphics card is what renders the game’s images. Ideally, you would want to get the best card for your budget to get the best graphics experience. RAM - Memory is where your most-used information is stored. The more RAM you have, the more memory is stored for fast response when data is needed. Power Supply - Never cheap out on your PSU. Ever. It’s what provides every single piece of hardware the right amount of power. Ideally, you’d want a quality PSU to safeguard your system. Case Fans - An adequate amount of case fans keep the system cool. Ideally, 2 intake fans and 1 exhaust should keep the system cool enough. Storage Devices - A combination of both types of storage devices-- HDD and SSD-- is what you need to get the best of both worlds: speed and storage space. Case/Chassis - Choose a case that has enough room to fit all of your system’s components. 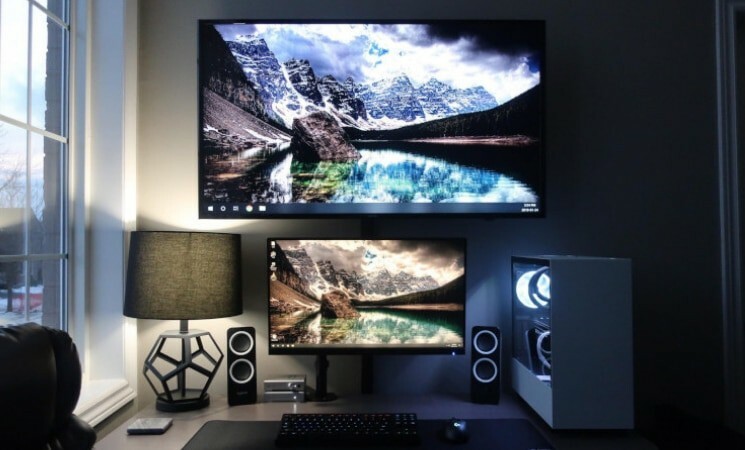 When building the ultimate gaming setup, go with what you prefer and don’t forget to make use of valuable online resources and manufacturer websites like ASUS, NVIDIA, AMD, MSI and other known parts manufacturers for parts information as well as PCPartPicker to check parts compatibility.